When QuickTime is your chosen export format, some of the QuickTime movie settings will be overridden by the Storyboard Pro project or export settings. NOTE: Refer to the QuickTime documentation to learn more about these movie settings. Decide whether you want to export the entire project (All), a selected frame range, a selected scene, a selected panel, or tracked panels. If you decide on the latter, be sure to enter the frame range in the fields provided. 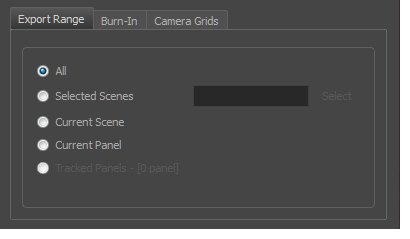 In the Scene Picker dialog box, you can select scenes by sequence if your project contains sequences. ‣ Print Additional Duration: Prints an additional duration on your video, defined by the Units and Repeat menu. ‣ Units: Displays additional duration information using Time Code or Frames units. 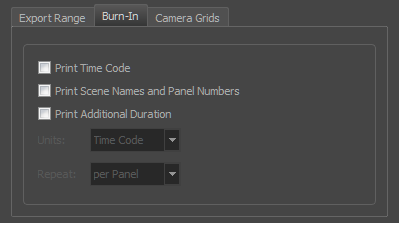 ‣ Repeat: Displays additional duration information per panel, scene or sequence. ‣ Project Safety: Prints the safe area on your video. 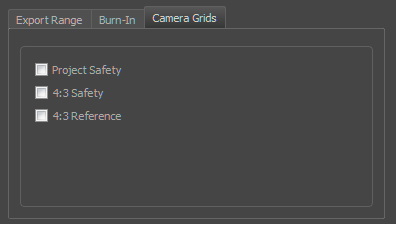 ‣ 4:3 Safety: Prints the 4:3 safe area on each panel of your storyboard that has a camera movement. ‣ 4:3 Reference: Prints the 4:3 area on each panel of your storyboard that has a camera movement.